How many times have I heard someone say high school is the best years of everyone’s lives? Too many times. For me, high school did not make up the *best years of my life, but they weren’t the worst. The worst is reserved for middle school. I never think back and feel a warm, bubbly wave of heated affection for middle school, because those years mark the cruelest three years of my… my what, exactly? Childhood? Adolescence? No. Middle schoolers are at that awkward in-between age, stuck leaving their childhoods behind as they move on to becoming full-fledged teenagers. It’s the pre-teen years, and for many students, this not only means fluctuating hormones, but changes in social hierarchy. I will shoot the most incredulous look I can muster if anyone claims these years bring back fond memories. Because they don’t. And no child can escape the terrors of †tweenhood. And Teddy Steinkellner? I think he understands this. Pre-adolescence is a confusing period to navigate, and Steinkellner’s debut novel, Trash Can Days, captures just how uncomfortable it can be. The book surprised me by how realistically the author portrays junior high (or in my case: middle school) life—this is no Diary of a Wimpy Kid, Alvin Ho, or even Lizzy McGuire or Breakfast Club. Characters are betrayed by their friends and family, several are bullied, others desperately wish to fit in while one wants to dominate the top of the social ladder, and a more serious matter of gangs and gang violence threaten to permeate one character’s life. Despite all this, Steinkellner writes with laugh-out-loud humor that balances the novel’s drama. In first-person narrative, Trash Can Days follows the lives of four characters voyaging through junior high. Jake and Hannah Schwartz—siblings, separated in age by one year—couldn’t be any more different from each other. Jake—with his bushy hair, questionable fashion taste, and endless love for “childish things”—becomes not so much of a nerd but a scapegoat. He’s an easy target for bullies, even for his sister and (former?) best friend. Hannah, however, is the Queen Bee we all know and hate—but Steinkellner humanizes her character, however self-absorbed and irritating she remains. Next is Danny Uribe, a boy whose body is growing faster than his brain, which reels in all sorts of drama that rivals Hannah—and that’s a lot of drama. That leaves Dorothy Wu, the loveable weird girl who feels perfectly undisturbed about her friendless state or low social rank. It’s on rare occasions that I’m not completely turned off by alternating perspectives in a book, and Teddy Steinkellner’s Trash Can Days is part of the exception. Often, I find that I become attached to one character and will skim-through other passages to read more from that person’s perspective. I can’t say this didn’t happen with Trash Can Days, as I instantly fell for Dorothy. What’s not to love about “weird” characters? They’re exceptionally different from the herd, and that is what makes them interesting. The diversity Steinkellner provides—and not just ethnically, but in depictions and personalities—makes a curious hook for all characters, so as much as I adore Dorothy, I find Danny’s, Hannah’s, and Jake’s storylines equally engaging. I felt so engaged, in fact, that it maddened me. Why couldn’t these characters have been a part of my childhood or pre-adolescence? I wish they had been, because no matter how devoted I am to Lizzy McGuire, Trash Can Days is an accurate snapshot of school-life. I wasn’t one of the popular elite, but I wasn’t sitting with the “geeks and freaks” at lunch, either. I related to Lizzy because we were alike in this way, but I didn’t always have a loyal twosome who had my back at all costs. Middle school is a vicious place sometimes, and the lives of many middle schoolers aren’t PG-rated—sorry, Lizzy. This is what attracts me to Trash Can Days, and the well-blended humor makes for an added bonus. Realistic portrayal aside, I found I relate to Steinkellner’s book because I see parts of myself in many of these characters, and I think others will, too. Where Jake and I are alike rests in his habit to brood and wallow. Ugh! (In self-defense, I look back on this period of my life in shame. “It was hormonal,” I say. “What almost-teen/actual-teen isn’t moody?” I don’t puke rainbows and sunshine for anyone.) As frustrating as he is at times, I extend my sympathy toward Jake because I understand him. And Dorothy? I saw my old thirst to write reflected in her, but her character brings so much more than passion to the story. Dorothy feels no fear in doing what she wants to do. Unlike many teenagers, what people think doesn’t worry her. She’s bold enough to attend dances solo and scare people in the hallways with feral animal noises. 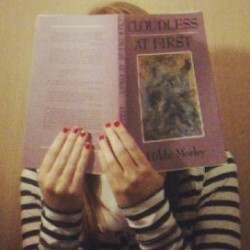 She loves to write and writes about anything, reflecting reality in her fantasies. Her favorite activities include manga-reading, Internetting, video-gaming, and following her morning ritual of brushing her hair 151 times (one stroke for each original Pokémon). She’s strange but quirky. Dorothy is simply Dorothy, and it’s this unique quality that makes her a courageous, beautiful character. Hannah and Danny are the two I had the most difficulty connecting to. It’s not that I didn’t see aspects of myself in Hannah, because I do, but in a much less diva-like way. In Hannah’s mind, her school is “Hollywood” and she is “US Weekly.” She can write a book with the amount of gossip she files away, which—yes!—she does, but in blog-form. A couple cruel and undeserving incidents happen to Hannah, and although these experiences allow her to change, it’s a turtle-slow process. But Danny? I have never felt so frustrated by a fictional thirteen year old before. Danny enters junior high a changed boy, and not just physically. Athletic and attractive, he’s much more well-liked than Jake. He’s the guy girls begin to notice, Hannah included, but he also attracts attention from the local gang. From the start, I rooted for him. I wanted him to do well, and then… Danny makes one wrong choice after another. He questions where he belongs: with Jake’s ritzy folk, or with his Hispanic family from the gang-run east end? I am white, middle-class America living in a less-than-diverse town. Of course I don’t relate to Danny on personal levels, but I feel Steinkellner articulates Danny’s struggle in comprehensive detail. Why Danny upsets me, however, is not about him questioning his place in the community. It’s about him behaving like a terrible friend and not acknowledging it. It’s about his lack of apologies, and how he dares to intentionally lead a friend into a life-threatening situation. Danny makes me angry because he steps up a little too late. So yeah. Danny pisses me off! But the book? The book is fresh air. It’s what realistic fiction needs to be: realistic without the cheese-lathered side-dish of hunky-dory. (*If high school is as good as life gets, then I am a rolling wrecking ball crumpled in eternal regret. 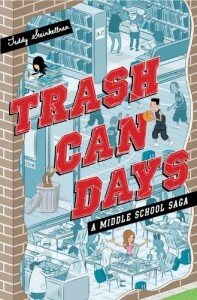 Thank you to NetGalley and Disney Book Group for providing a free copy of Trash Can Days: A Middle School Saga in exchange for my honest review. This review and more can be read at midnight coffee monster.